Are you moving from the UK to The Hague? Then you might be looking for a removal company to perform your removal. Henneken is pleased to help you moving to The Hague! Our removal company was founded in 1870, which means that we are very experienced in moving people and companies from the UK to The Hague. Since we nowadays perform about 450 removals and relocations between the UK and the Netherlands or Belgium each year, we know exactly what to do in order to make your removal to The Hague a comfortable and relaxed experience. One of the many reasons why people prefer Henneken to other removal companies when moving to The Hague is our reliability. At our removal company, we have a modern fleet, use modern and reliable equipment and work with experienced and qualified removers. They will handle all your objects with the best care possible. People are moving to The Hague for several reasons. Some have their family living in The Hague, others are moving to The Hague because of their work. Whether you are moving to The Hague for your family or your work or maybe for a totally different reason, a removal always causes lots of stress. You have got to regulate so many things that there is high risk of forgetting things that need to be done. That’s why you can fully rely on our the removers of our removal company. In order to maximize comfort for you, we offer great removal services like handyman service and storage service. You can store your furniture and other objects in our storage if you are moving to The Hague from the UK or Ireland. Our storage is equipped with a modern climate control system and perfectly protected against fire and burglary. In order to make your removal to The Hague a pleasant experience, we would really advise you to make sure your preparation is great. After all, a good preparation of your removal to The Hague is half the battle. Since removals are among the most restless activities in human life, a good preparation will help yourself making your removal to The Hague much more pleasant. Our removal company has 150 year removal experience which we love to share with you! Please do not hesitate to request our removal checklist with very useful removal tips! 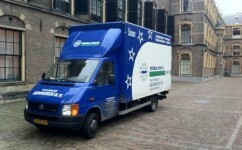 Our extensive experience and excellent removal service make Henneken the ultimate removal company for moving you to The Hague. Either if you would like moving a lot of objects to The Hague or only a few, please do not hesitate to request a removal quote! Within two days after your request, you will receive a removal quote from us. For more information, please do not hesitate to contact us by telephone: +31 (0)79 – 361 13 68. We are also pleased to offer you a free pre-move survey visit by our surveyor right away.